It is not often that I get to photograph a wedding in January. 2019 started out with a bang with Lauren and Blake on my calendar! Their January wedding did not disappoint one bit. Although it was a pretty cold day, it could not have been a more beautiful day. 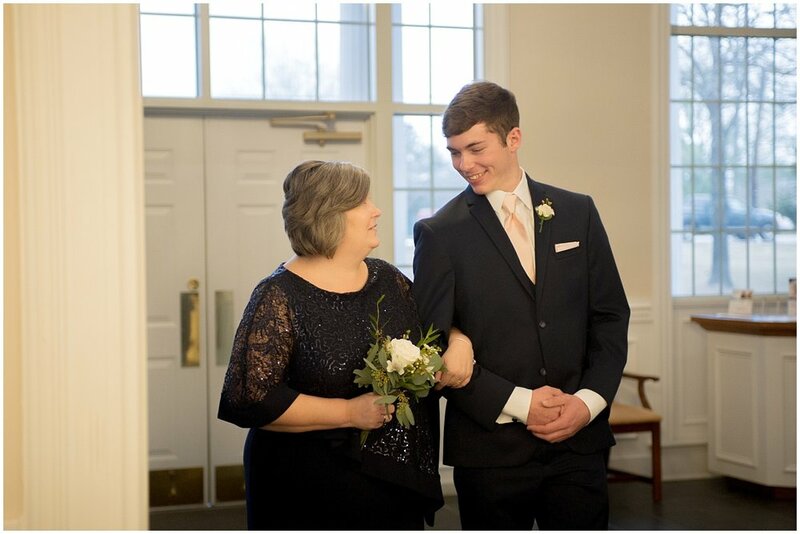 The two shared their vows with one another among family and friends at Westminster Presbyterian Church in Sumter, South Carolina. The best time prior to the ceremony are those few minutes the bride has set aside for special moments. Lauren decided that she wanted to have a couple of first looks, one with her father, her brother and her bridesmaids. I am a daddy’s girl, and I won’t tell you how emotional I was when Lauren’s daddy walked in the room to see his baby girl for the first time. (I may have even teared up again while editing that portion of their wedding…) Just by the images alone, you can tell how much her daddy loves her and how proud he is of her.These moments mean so much, and are otherwise not captured, but allowing for that time prior to the main event gives dad the time to calm his little girl’s nerves and embrace her one more time before he walks her down the aisle. Not only was Lauren’s daddy so full of emotion, Lauren’s mother was right by her side the whole way throughout the day. She definitely made sure that Lauren’s day was pure perfection with no detail left unnoticed. We were able to build in some time with just Lauren and her mom while she got dressed, putting on her jewelry and time to love and exchange some motherly love and advice. The wedding ceremony took place in the beautiful sanctuary of Westminster Presbyterian. The service was intimate yet simple, with an exchange of traditional vows. Lauren and Blake sealed the deal with a kiss then off to the reception they went! The one main thing that Lauren told me on a few occasions, was that she wanted to dance during her reception. And yall, she danced to her hearts content! She and her bridesmaids literally danced all night long! I love when the dance floor is filled with guests shimmying and shaking to all kinds of music and it especially helps when the DJ is full of energy and excitement! The DJ, Jonathan White, was on point the whole night keeping the party going on well into the evening. Between all the dancing and the delicious food catered by Lil Fred’s, the night was a blast from my perspective! I thoroughly enjoyed working with both Lauren and Blake’s families and can guarantee that these precious newlyweds have no shortage of love and support as they enter in to this next step of their lives. Lauren and Blake, thank you so much for allowing me to be a huge part of your wedding day. I am so excited for you both and those sweet baby girls. You two are going to be rocking it, no doubt! I pray that you both have a beautiful marriage, filled with a whole lotta Jesus, memories, love and more.